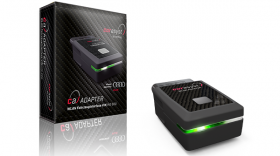 The CAR ASYST ADAPTER is a high-performance WLAN-Ethernet bridge. It enables CAR ASYST APP to directly access a vehicle with Ethernet access for mobile use. The CAR ASYST ADAPTER is a high-performance WLAN-Ethernet bridge. It enables CAR ASYST APP to directly access a vehicle with Ethernet access for mobile use. A transparent connection is established between the WLAN interface of a smartphone and the Ethernet port at the diagnostic connector of a vehicle. The CAR ASYST ADAPTER is easy to use and can be connected with a smartphone like any other standard WLAN device. The device has an eye-catching, ergonomic, compact design that leaves plenty of leg room in the footwell on road tests. The activation line necessary for Diagnostics over IP (DoIP) is addressed by the CAR ASYST APP on the CAR ASYST ADAPTER in such a way that Ethernet communication is enabled in all relevant situations. The ECE type approval and the associated tests are the basis for interference-free and safe operation of the device in the vehicle. By using a glass-fiber reinforced and impact-resistant plastic as well as a high-grade OBD connector, the device can also withstand severe strain. Thanks to the WPA2 encryption with PSK, the vehicle data is safe from any attempted eavesdropping over the transmission path.